Clarksville, TN – Austin Peay State University’s football team routed Morehead State, 69-13, in a Saturday night showdown at Fortera Stadium that featured an Ohio Valley Conference record 10 rushing touchdowns—four from the feet of sophomore quarterback JaVaughn Craig. 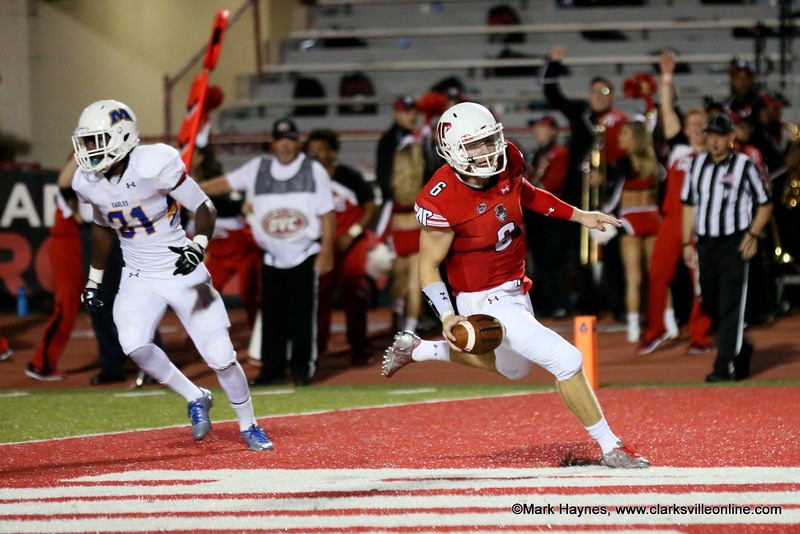 Austin Peay Football racks up 668 yards of offense in 69-13 win over Morehead State. In front of a Fortera Stadium-record 8,152 fans, the Governors succeeded in going over, around and through Morehead State’s defense, accounting for 668 yards of total offense, including 477 on the ground. Sophomore Kentel Williams needed just eight touches to rush for a career-high 203 yards, becoming the first Governor to go over 200 yards in a game since 2009 (Ryan White; 228 yards vs. Southeast Missouri). The standouts were too many to count for Austin Peay on this record-shattering Saturday. Without even touching the ball in the second half, Williams broke 200 yards with runs of 61, 51 and 55 yards sprinkled throughout the first half. Craig scampered nine times but found the end zone on four of them, while adding in a solid 8-for-12 passing night with 118 yards to keep the defense from loading the box. Craig’s favored target was Kyran Moore, who hauled in five passes for 96 yards and also added one of the Governors rushing touchdowns—he finished the game with 129 all-purpose yards. Williams may not have gotten into the end zone, but a host of other Governor ball carriers did. Working in to give Craig a breather under center, freshman Jeremiah Oatsvall scored twice, from 31 and 14 yards out, while Ahmaad Tanner (12 yards), Tre Nation (32) and Prince Momodu (5) also had rushing touchdowns. And lest all the attention go to the offense, Austin Peay kept up a season-long defensive clamp down, limiting Morehead State to 2.2 yards per carry (77 yards on 35 attempts) and forcing four Morehead State turnovers. Trent Taylor, Malik Boynton and DeKeivis Perry each secured their first career interceptions, while newcomer Nate Howard shined in his APSU debut with eight tackles, 3.5 for loss, and a sack. As the game went along and it became clear that the Governors were going to secure the first win of the Will Healy era, the fans grew excited. Midway through the fourth quarter, there were loud “Lets Go Peay!” chants ringing throughout Fortera Stadium. By the time the fourth quarter clock hit all zeroes, bedlam was brewing on the turf as euphoric fans rushed the field. Everyone has waited for this win. Fans, players, coaches, staff—everyone is invested, and that investment paid dividends Saturday night. The 69 points scored by the Governors offense were the most since scoring 73 against Morehead State in the 1994 Homecoming contest. It is the Govs largest margin of victory (55) since defeating Kentucky Wesleyan to start the 1994 season. Austin Peay’s 10 rushing touchdowns broke both the program and Ohio Valley Conference record. That total was one shy of the FCS record set in 2004. The Governors marched through a former Pioneer Football League foe in Saturday’s contest. Next week, they go toe-to-toe with archrival in the OVC opener Murray State in a 6:00pm, Saturday contest at Roy Stewart Stadium.